Once again you fine friends left me in awe of your sweetness and kindness! Today's reader space was a nominated space, and the second I saw it, I knew why! When I let Linda know she was nominated, she was so sweet in providing me some additional details about her incredible space! "I'm so excited to share my craft room with you today! My craft room is a dream come true for me and I feel so blessed to have a creative haven in my home. We moved last summer into a home with an extra bedroom and my poor husband, Davis had no choice but to let me turn it into a craft room! I decided to use my craft supplies to "decorate" my craft room. Being surrounded by the colors and textures not only inspires me, but it also makes it easy to find things. I accessorized my room with things I love like vintage goodies, bright colors, and repurposed items. I was also really lucky to have The Original Scrapbox send me some of their products to put in my craft room. Their fold away storage systems are amazing! And I will admit, my room is not always this nice and tidy....my craft room does know how to get down and dirty when I'm in the middle of a project! You can check out the video tour of my craft room here. I hope you enjoy my room! Thanks for letting me show it off, Jen! Ready to be in love?! 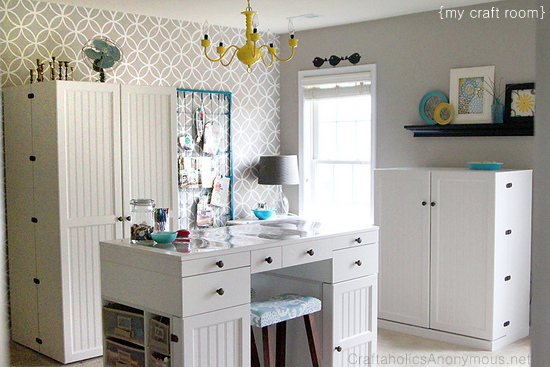 Isn't that stenciled accent wall swoon worthy? Such a great statement in a creative space! I can't get over all of the sweet little details. Like that $3 chandelier that looks like a million bucks thanks to some yellow spray paint! I also adore that the decor is compiled of functioning craft supplies! How creative is that ribbon storage? I love that she organizes it by color in a common method! Smart gal! 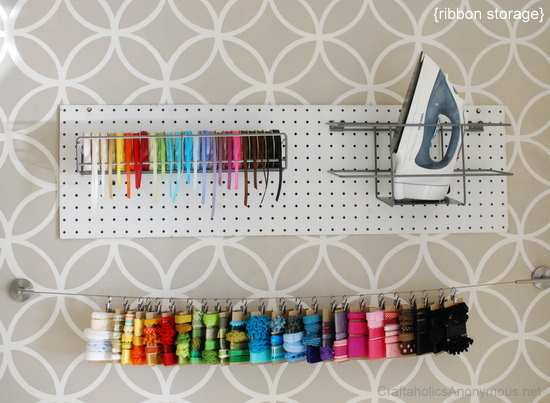 Her fabric storage is equally as genius! A simple rod with some clips keeps all of her favorites easy to find and adds a great treatment to the wall! Have you ever seen The Original Scrapbox? It's insanely packed with endless storage! Holy Moly Rocky! Now that is amazing use of space! Looking at the room, you would never know all of that storage is inside that single cabinet! Same with the sewing station! What's not to love? Another really great workspace that also folds up into a small cabinet when not in use! One of my favorite features in the whole room is the crib spring turned inspiration board! Linda did such an outstanding job designing her room. If I had a space like this, I would surely lock myself in there for hours days and get lost in happy craftland. Wow! I am so grateful Linda let me share her incredible room today! For more details, ideas, photos and even a video tour, you can check out Linda's blog here. What's your favorite moment from today's space? The vintage inspired pieces and thrifty makeovers? The concealed storage? 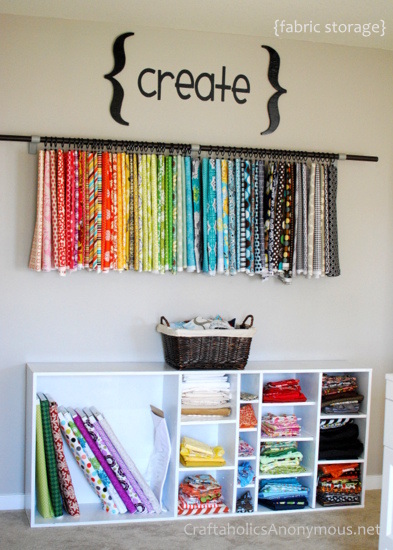 The creative ribbon and fabric display? What a gorgeous room! I'd have to say my favorites are the blue chairs and vintage details and that stenciled wall! Such a nice pairing of modern and vintage details. Now I'm off to check out the video :) Thanks for sharing and inspiring! Tracey, I am not the owner of this site, but the text you are talking about is just an image she inserted into the blog post. Absolutely amazing! I love the blue chairs and the wall paper. And I can't over how many crafting supplies she has! I am obsessed with what she did with the crib spring. Im thinking of using our old one in my bedroom and using clips to put pictures on it. Thanks for sharing!! Wow! This place is for real? This isn't a staged room for a magazine shoot? That's incredible and it's hard not be inspired after looking at that room. This is beautiful! I love the use of the wall space and how she incorporated all of the fun vintage pieces. Very inspirational! I AM in love! 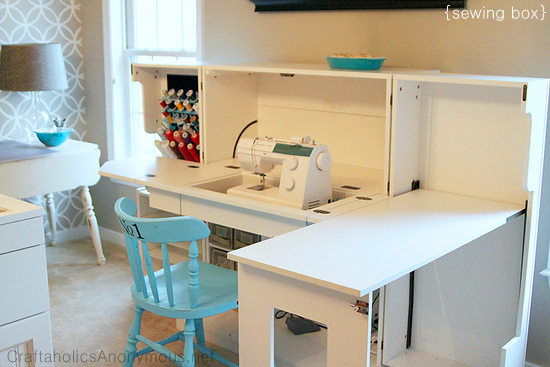 I love the sewing station and the center work space. I have a small room that is our craft/toy/guest room so anything that can be closed up and not look cluttered is a must! That orignal craftbox is the neatest thing I have seen in a long time. I can't believe one simple piece of furntiure can hold all of those craft supplies. My storage loving self is going crazy!!! Ok! The whole space is fantastic. I am so head over heels for the clips and the fabric. May have to adopt that over here somewhere. I seriously just had an organiz-asm! I want one of those Workboxes ASAP! However, just looked at the cost and they will be on my to-save-for list for a bit and my $70 craft desk will suffice. Beautiful room and perfect inspiration! Oh my goodness, now I want to move. If you're not already creative, you certainly will spontaneously become it as you look at this room. Awesome. The crib spring wall thingy is GENIUS. I can't wait to get my hands on one! 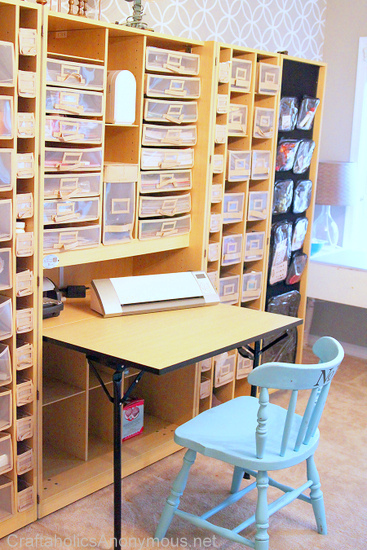 We loved Linda, The Original ScrapBox and her Dream Craft Room! Love the whole room but the black shelf with turquoise and yellow accents is adorable, I've already copied the picture so I can paste it in my dream book. If I had the wall space I would do the bedsprings because I have notes to myself clipped with clothespins on everything in my craft room. What an amazing room! I love the EZ View desk with the glass top, it's soooo pretty. I've been considering taking sewing classes at a local academy and now I'm even more determined to learn! OMG! I LOVE everything about it! Thanks Linda & Jen for sharing! I am in the middle of my craft room project... I can only hope it turns out half as cute AND functional! I am in love! My. Jaw. Dropped. when I saw these photos. So gorgeous. Just so so gorgeous! That's some serious storage!! Jen, you continue to amaze me! I LOVE this room!! I just checked out the original scrapbox though and that stuff is way too expensive for me. LOVE THIS! especially love that the storage units fold in and out! Is there any way to know what color that solid wall is painted? Very nice; great job you did here. Really like the functionality of it all. Very organized, functional and beautiful. Love it! Love, love, love it!! It is a dream craft room come true!! 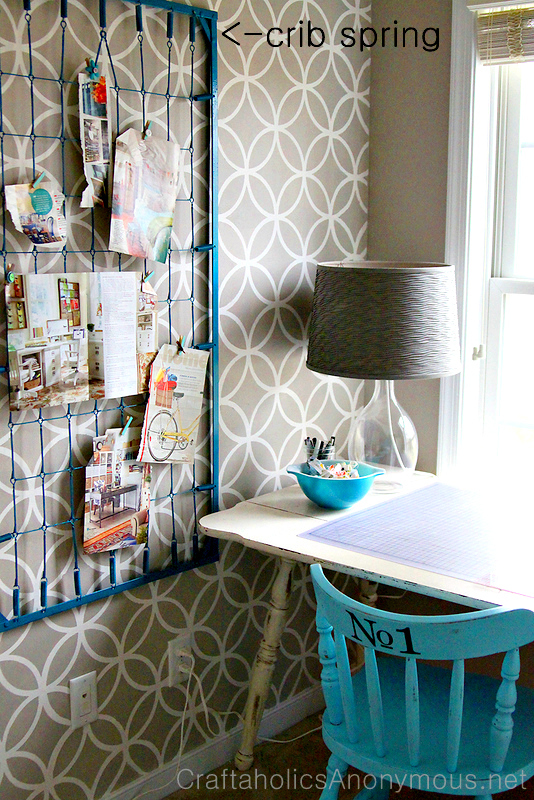 Love the stenciled wall and crib spring idea. Looks great! so beautiful! LOVE the grey and the pops of color! i really love this. I'm so jealous of those people who have the space for this. Do you have any tips for turning a small closet into a great craft storage space? The hardest thing about the space is that it is deep and not wide and it has a slanted ceiling. Any help is greatly appreciated. Thanks so much!! I love the stenciled wall but I really really love the crib spring! I am having a hard time "letting go" of baby times so this would be so cool! LOVE the crib spring idea! Totally shabby chic, totally my style! This is amazing! This looks like it is straight from a magazine! When I have a home of my own, I will SURELY start storing my fabric like that! I will also have to look into a folding desk like that for my sewing machine! Thanks so much for sharing! Love the crib spring idea! But how do you hang it? I have a question about the sewing box. Is this purchased or self designed?